Home. Home to trees and fields, dirt roads, and cooler temperatures. Home to the family. Home to my friends and community. When I arrived on Tuesday, the house was woodstove warm and welcoming. Both dogs were overjoyed that I wasn’t ( apparently) gone for good. Aah, home. Now back to work. 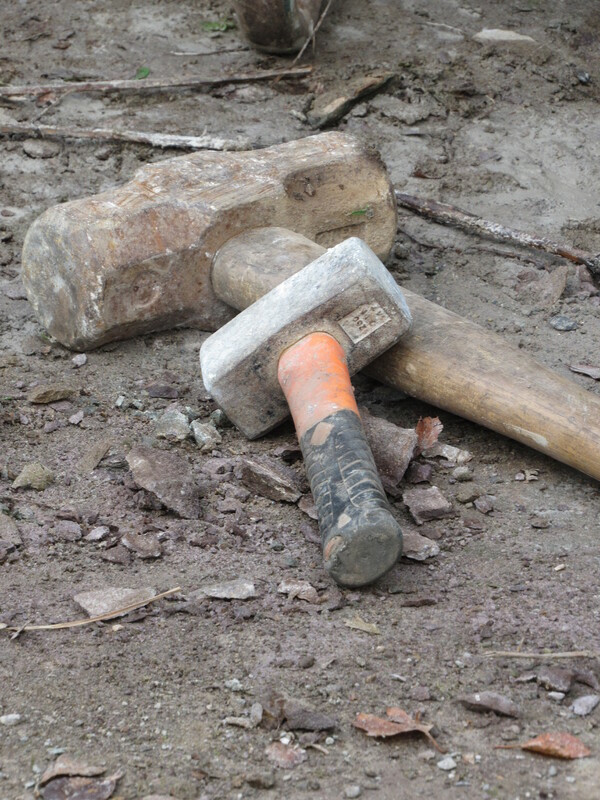 Winter projects on the docket. Work on the board and batting for the studio. Re-shingle the back of the house. Wool to spin and send out for the yarn CSA. 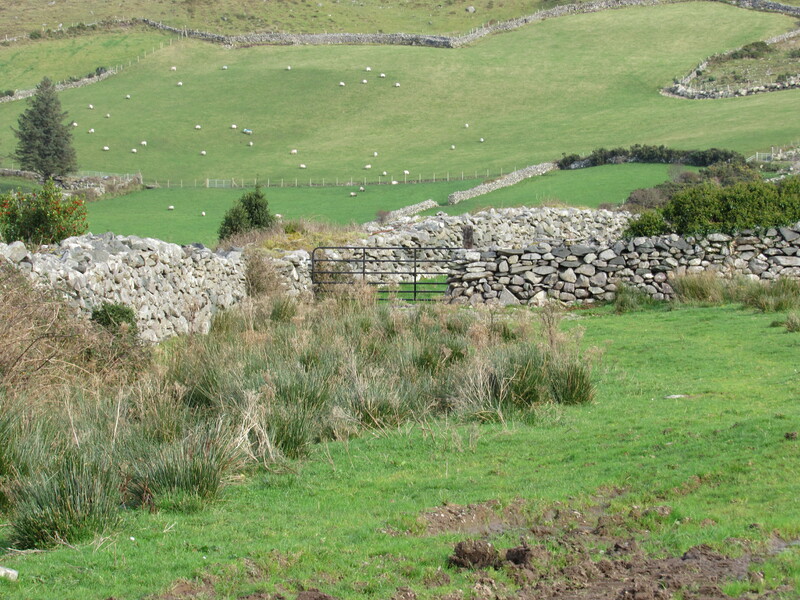 Speaking of wool, in Ireland the landscape is covered with sheep. Most are breeds suited for the conditions there, cold and wet, and most breeds are raised for meat. 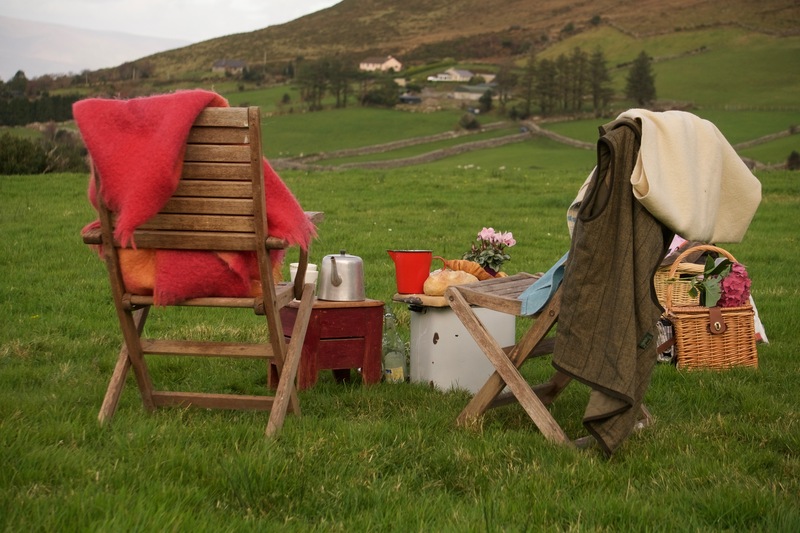 The market for fleece is not great and it may be difficult to find yarn made from Irish sheep. Real Irish yarn, that is. 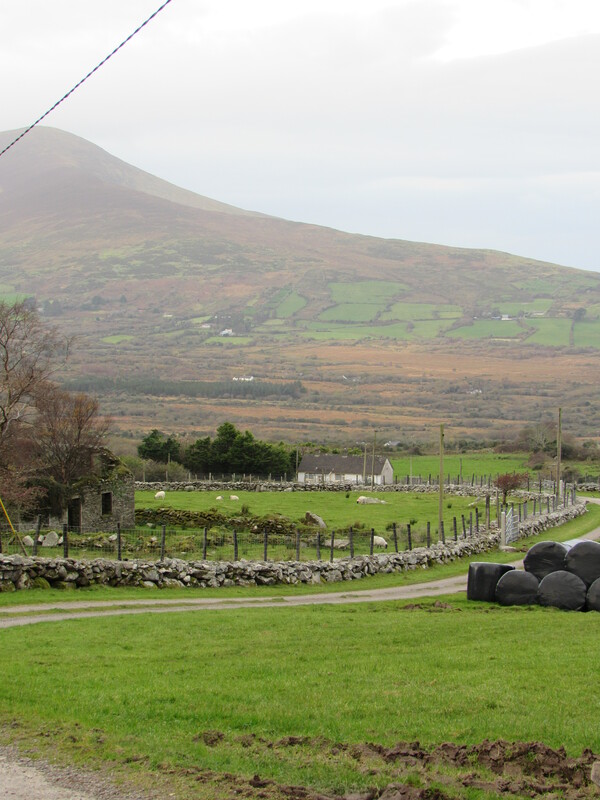 Not likely that you will find merino sheep on an Irish farm. The merino would not stand the conditions in Ireland. 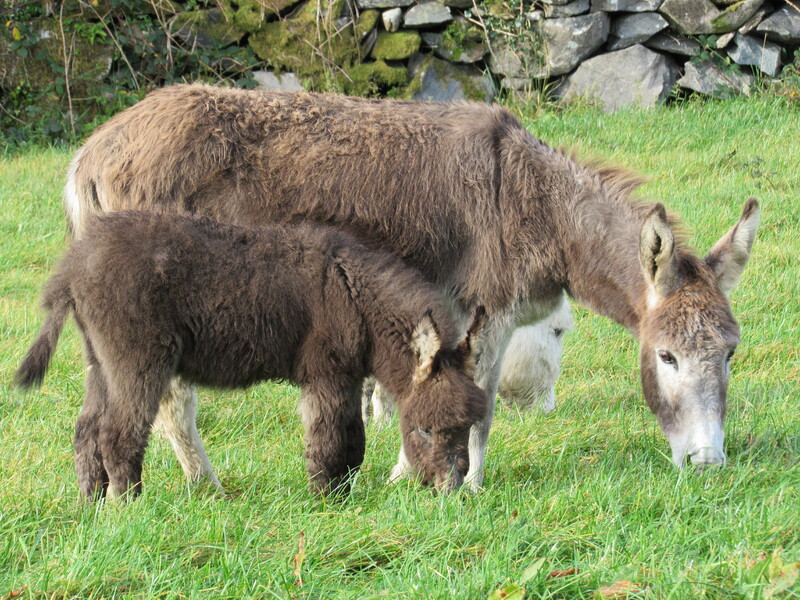 The breeds in Ireland tend to be a courser breed of sheep, great for rugs and weaving. The fiber in Ireland would be considered ‘carpet wool’, strong, coarse fiber truly great for weaving tapestries or rugs but often considered too scratchy for garments. But, I love wool and back in the day, even our wool here in New England was typically more scratchy than it is now. Remeber those wool snowsuits kids wore? Breed importing has improved over the last 50 years and raising sheep breeds that have soft, fine fiber, are now widely available here. 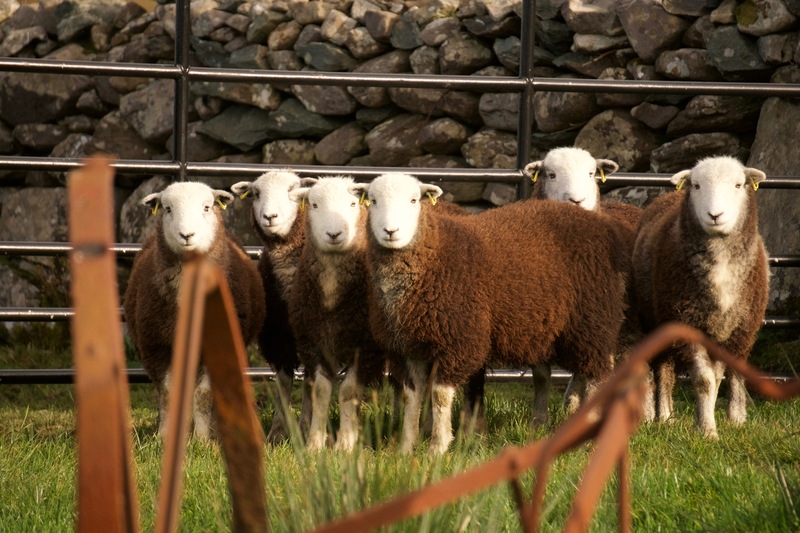 Our weather in the Northeast being dryer allows us to manage with some of the finer wool breeds. Still, I personally love that old fashion course and strong wool all sweaters and socks ( and snowsuits!) were made from in year’s past. Bartlett wool and yarn from Briggs and Little are still companies that produce yarn using fleece that is a mixture of breeds, all put into a wool pool, and spun into yarn. 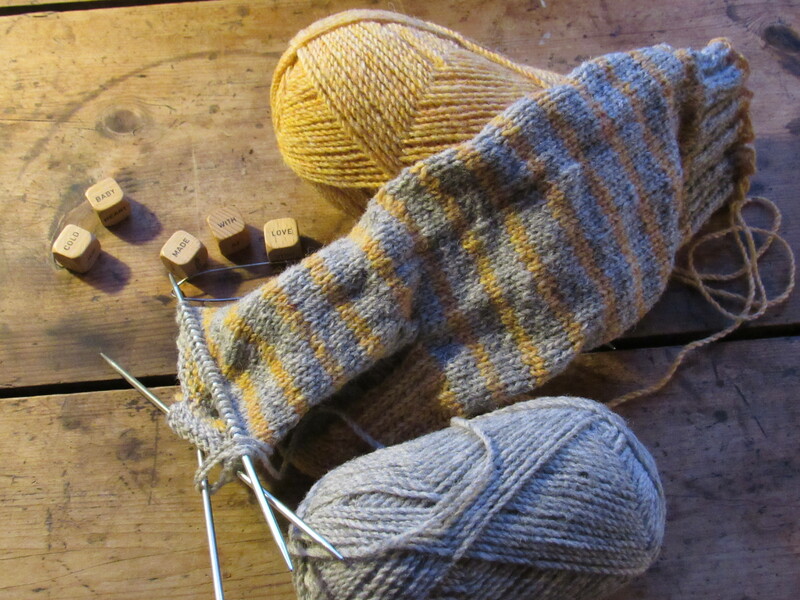 Lots of my socks are knit with wool from Briggs and Little. I call them ‘socks that are not for the faint of heart’. They are a bit scratchy (I don’t get the heebie-jeebies from scratchy wool on my skin) and they are tough…the course wool does not pill or tear as easily after lots of use. In Ireland, I did find a shop that carried true Irish yarn ( in Donegal) and it is scratchy, but I love it. My green wool hunting pants are scratchy. My vest from Filson is a thick felted wool that is scratchy. But both are two of the warmest garments I own. The sheep we raise at Fernwood are a fairly longwool breed, soft and lustrous, beautiful wool….and warm. They are a sheep breed I find really works for all the various knitting and felting I do.They grow excellent lamb for the freezer. I’ll always buy some rough and tumble yarn for sock knitting or for that outdoor barn sweater I know will stand the test of time (and abuse). 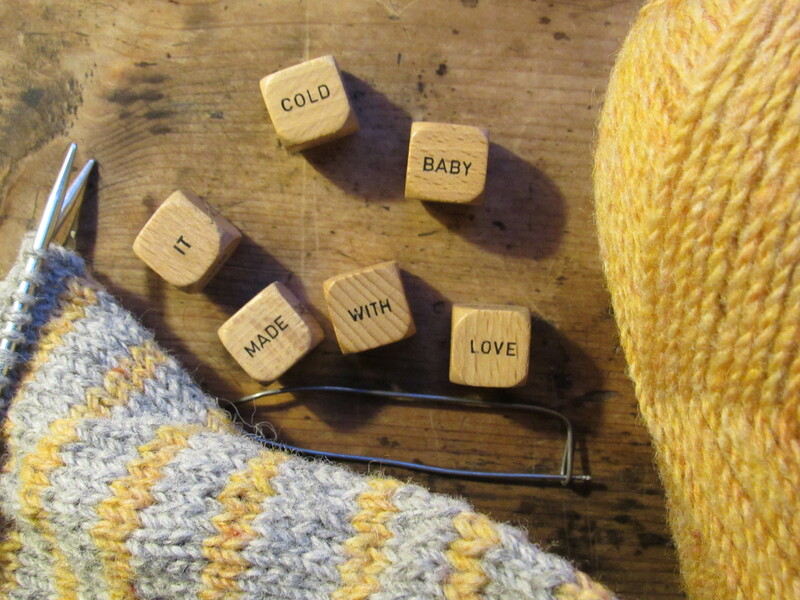 Among the other projects on the needles these days…a baby sweater, some mittens, a few scarves, there are also some hearty socks in progress, made with tough and gnarly wool, just waiting for the inevitable cold our Maine winters bring. And I know they’ll do their job! Today we’ll slow things down a bit. No racing about, no running for things in town. 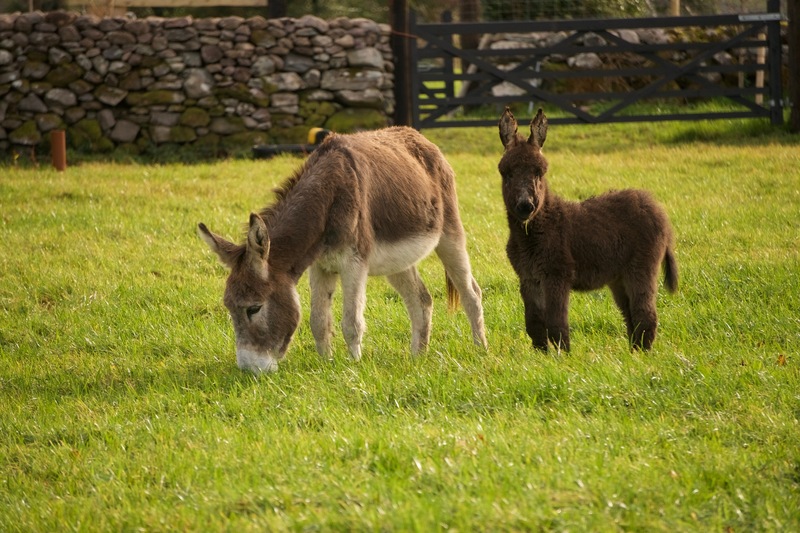 We’ll spend some time at the farm, visit with the donkeys, we’ll layout the picnic basket. 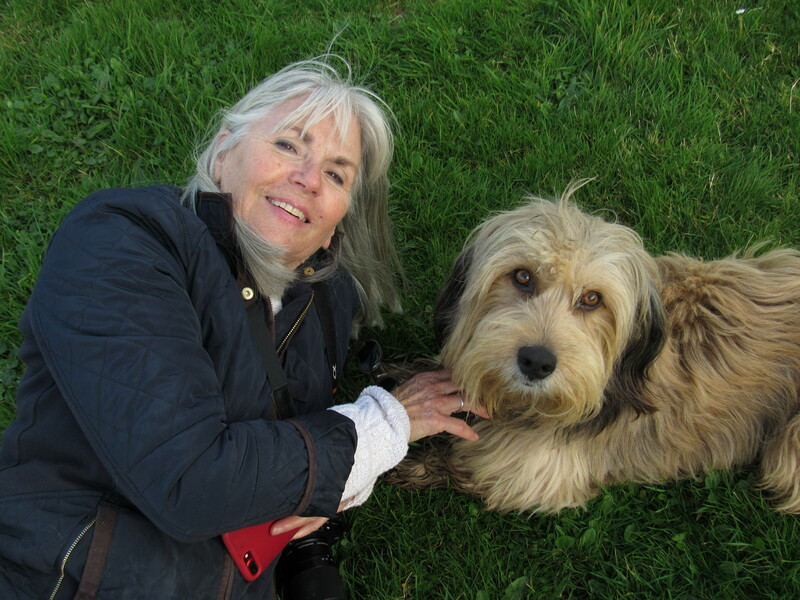 As often as I can, I walk a loop with Sally’s dog, Frazier. He and I travel the narrow and windy roads away from the farm, passing the neighboring fields of cows and sheep, just to admire and take in the incredible beauty of Ireland. 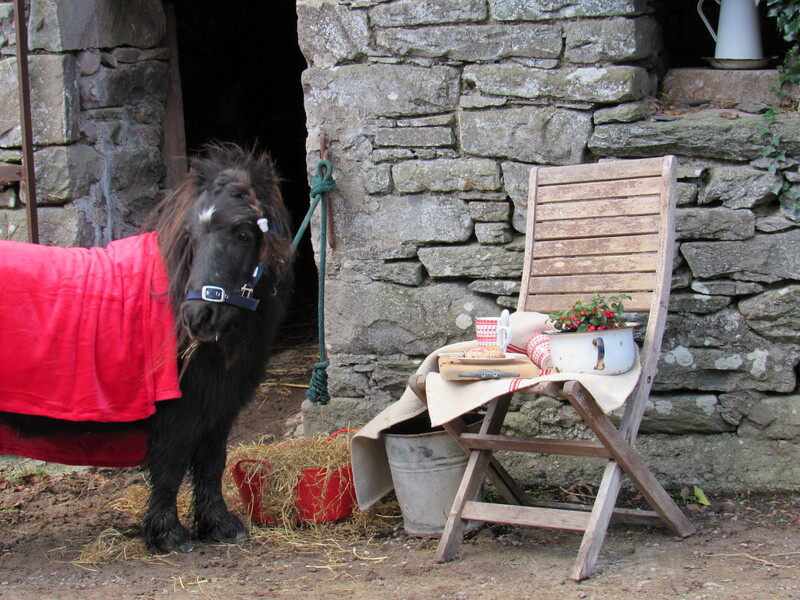 An afternoon tea with “Teddy”….try and tell me that Teddy is not adorable! The word ‘profound’ always comes to mind when I am asked to describe the landscape here. It is a landscape that seeps into your soul….it feels grand, it feels bigger than life. An arrangement of green and rock, mountains and expansive field, that is close to God. “Look around you. Appreciate what you have. Nothing will be the same in a year”. Also, I’ll re-post this poem by Paul Corrigan( which I love). It always reminds me of how fleeting life can be…even with the things we savor. Then there are the uncertainties and unfortunate moments that fall on all of us, and we repeat the proverb “this, too, shall pass”. Stay in the moment. Pay attention. Don’t wish a moment away. in the branches of our crabapple tree. and drop below the horizon. and hang in the branches without us. were down and the moon was waxing. hanging in those bare limbs? Come sit with me in the dark for awhile. 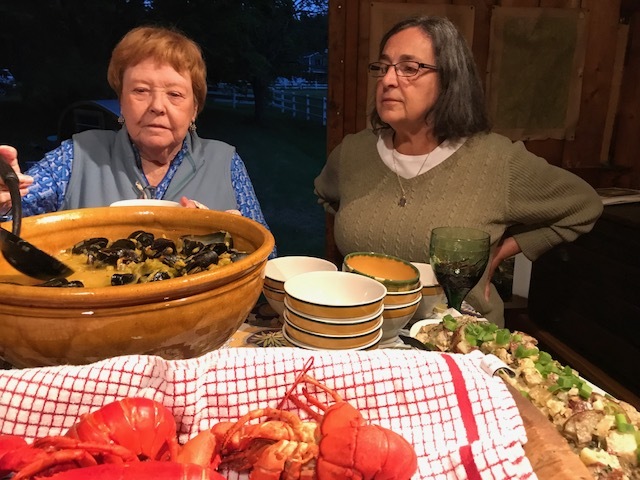 Before I left for my time in Ireland, I catered a dinner in a barn/studio for a friend. It was the end of September, the nights were perfect for an outdoor fire and to have the big barn doors slung open to let some sea breeze in. 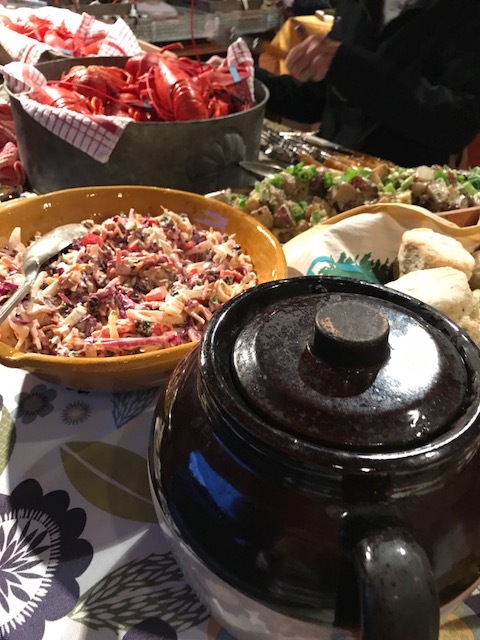 There was still plenty of garden produce available for salads and side dishes and it was also cool enough for several crocks of baked beans. 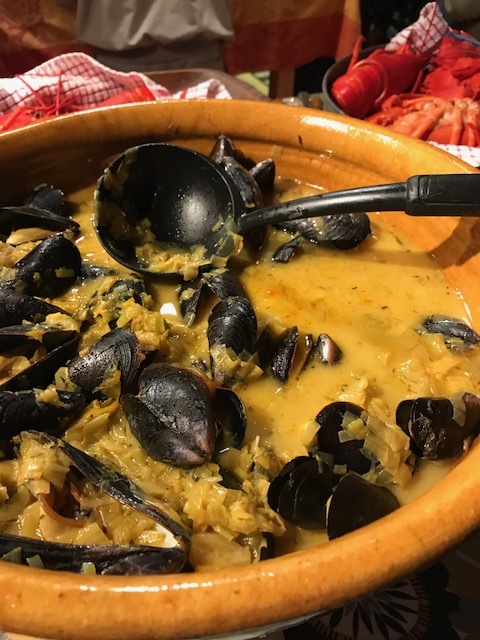 Steamed lobster, a broth made with mussels and saffron, and ice cream sandwiches made with home baked molasses cookies, helped to round out the meal. 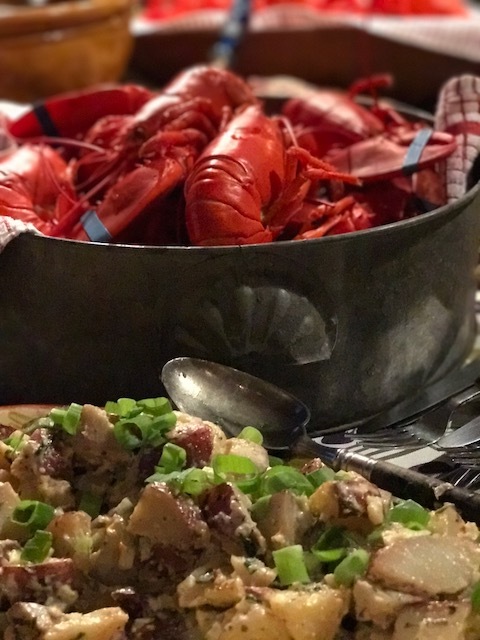 Every year I cater a limited amount of these farm to table dinners. I love doing them. I enjoy cooking at different locations, working with the scenery and atmosphere that each one offers up. Next summer I hope to offer a few Tear Drop trailer dinners. 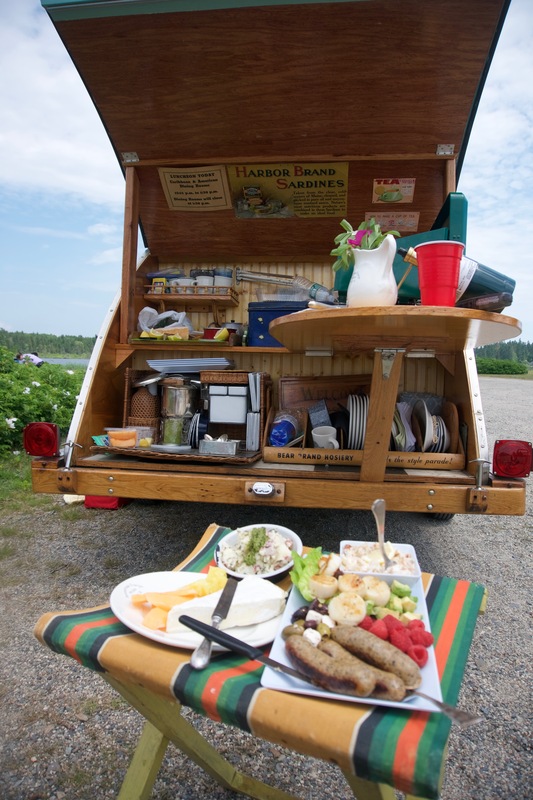 What do you think… vintage Tear Drop trailer, an ocean view, and a meal prepared with food from our farm and locally sourced ingredients? 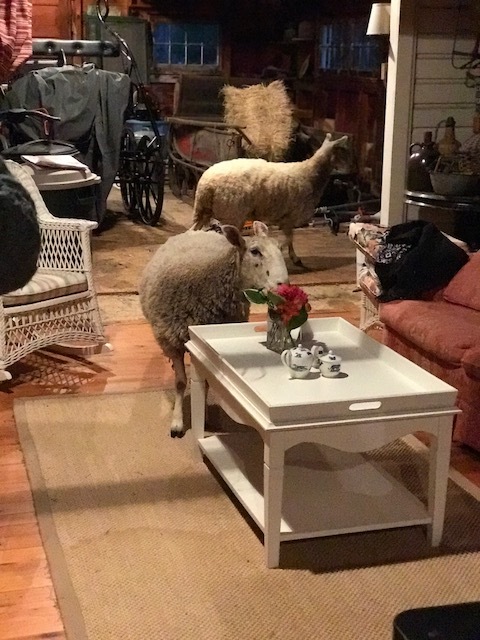 Here are some photos from the barn dinner….and, yes that is a sheep making her way through the dining area. 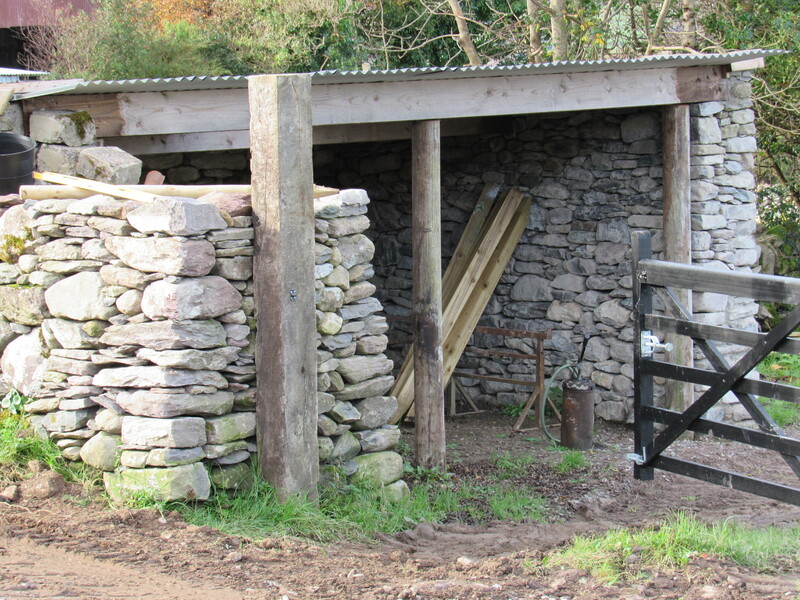 I did mention the word barn, didn’t I? Oh my! If you have any interest in having a very special meal prepared and served out of the cute and cozy teardrop trailer, email questions at fernwoodnursery@fairpoint.net. I’ll even brings along some sheep if you’d like! 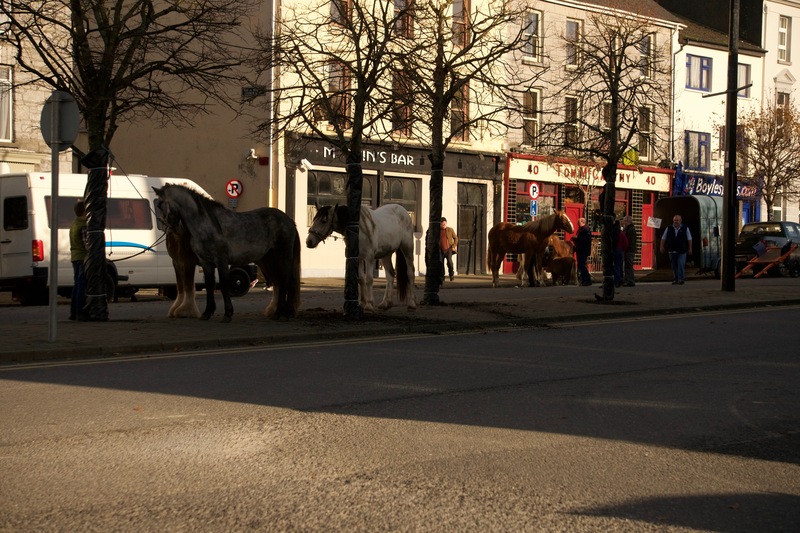 In Ireland….wear boots, always. Understand that when the sun shines, regardless of the time of day, it should be coveted and celebrated. It also reveals a brilliance that I’m not sure is experienced any where else in the world. The view is long, unlike home where the trees break up the scope of things, you can see long distances and this will make you want to put on your walking shoes (boots, remember) and start covering some ground. Around every bend there will be donkeys, and a sea of sheep, and fields and fields of grazing cattle. 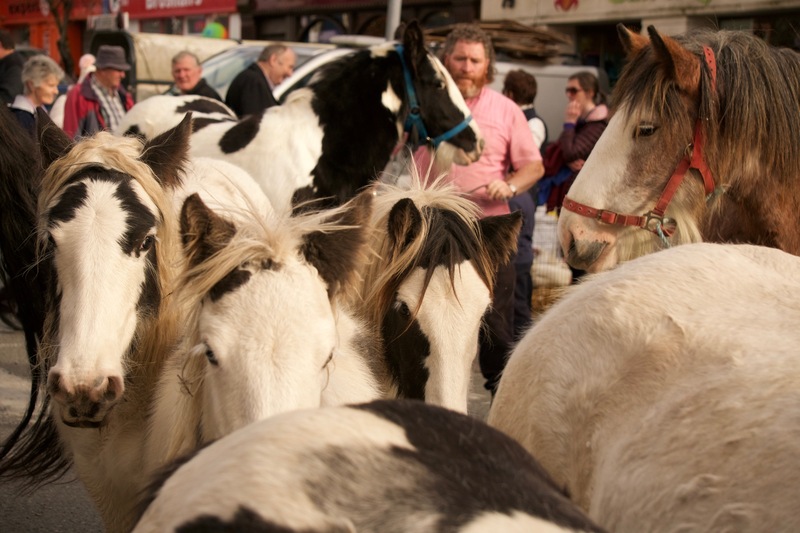 Horse fair are held in the middle of town and they are meant for trading. 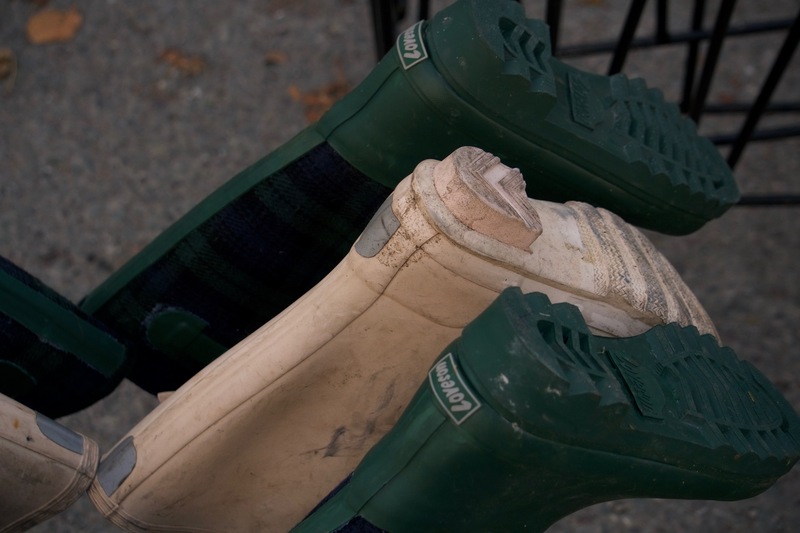 The grass, even in November when Maine farms are already tossing out hay to their critters, is green, green, green… but soggy, so as I mentioned before, you’ll want boots. The wind blows sideways ( I kinda like that) and the rain just shows up anytime it has a hankering to do so. A good rain jacket to go along with your boots is a good thing. The air smells smokey and peaty and moist. Quite nice and earthy. Learn to like tea, learn to love tea. And scones, with butter or jam, and definitely eat lots and lots of local yogurt, because that green green grass helps to grow great cows, which produces rich and tasty milk, which can be made into sweet and tangy yogurt. And butter. And cheese. And who wouldn’t travel far and wide for delicious cheese and butter? Well,that’s really all for now….more to come, I’m sure. What Are You Doing There Now? I am often asked this question when my friends and family back home find out that I am flying off to Ireland again. 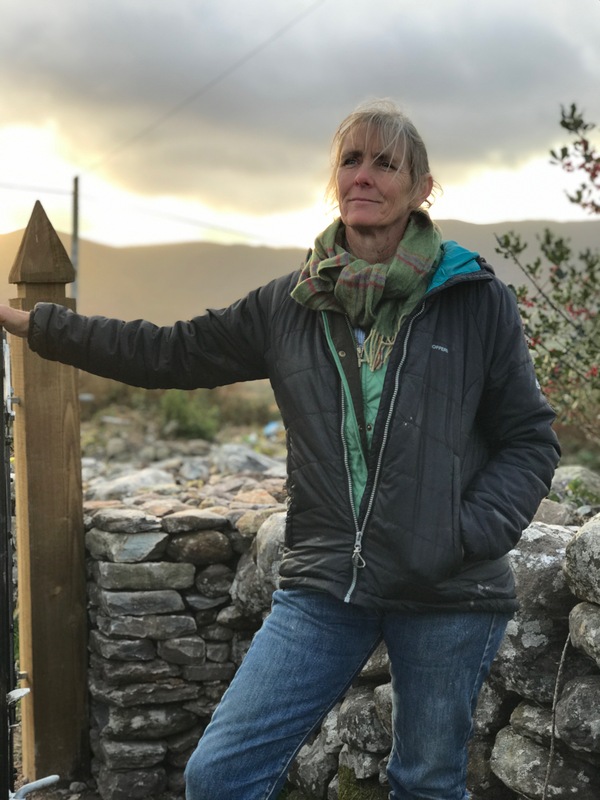 Coming to Ireland in the late fall, after the nursery closes and the firewood is put up and the hay is mounded in the barn, is something I have been doing over the last several years (7 years?). 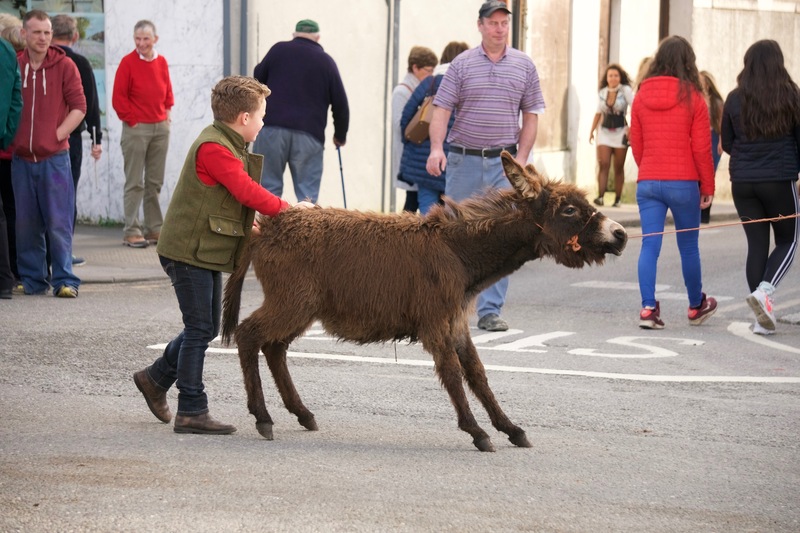 The first time I came was to help my friend Sally with a photo exhibit she was doing here in the town of Kilorglin. 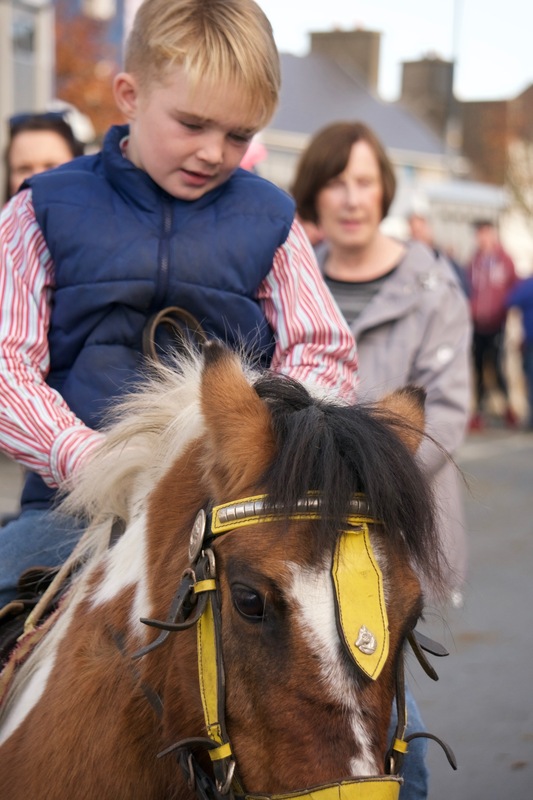 Next, it was to help her with her book project and collecting stories for A fair Day, The Horseman Of County Kerry. After that, I just kept coming and because we were (and are) having so much fun we’ve had to dream up new projects to warrant little ol’ me getting on a plane (which I don’t love) and leaving my home ground in Maine (where I am happily rooted) and then spending a goodly portion of the fall traipsing behind her as she conjures up new adventures. This year it has been helping her reclaim a farm in Glenbeigh. Reclaiming isn’t really the right description…. the land has been lovingly farmed and cared for over many generations. 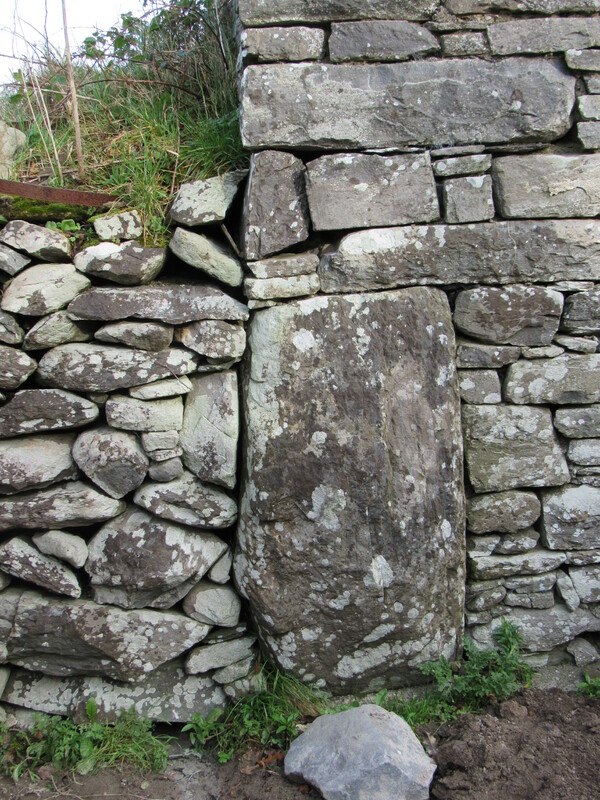 It is where a man lived his life and raised his cattle and did his chores and cut silage and helped birth calves and worked daily as all farmers do keeping with the tradition of such things. Now the man is gone, and though his nephew will continue to graze cattle and make hay on his uncle’s land, Sally has stepped in to help ensure that some of the buildings and barns are preserved. Right now the old house is getting a bit of a make-over….insulation, a new floor, a kitchen,, and a heating system. Like many of the old farms the house was not terribly insulated and therefor quite drafty…..a bit like our old farmhouses in New England, yes? The work has been going on for the last several months and before long ( 3 weeks!!!??) the house will be ready for a small gathering. Hooray! 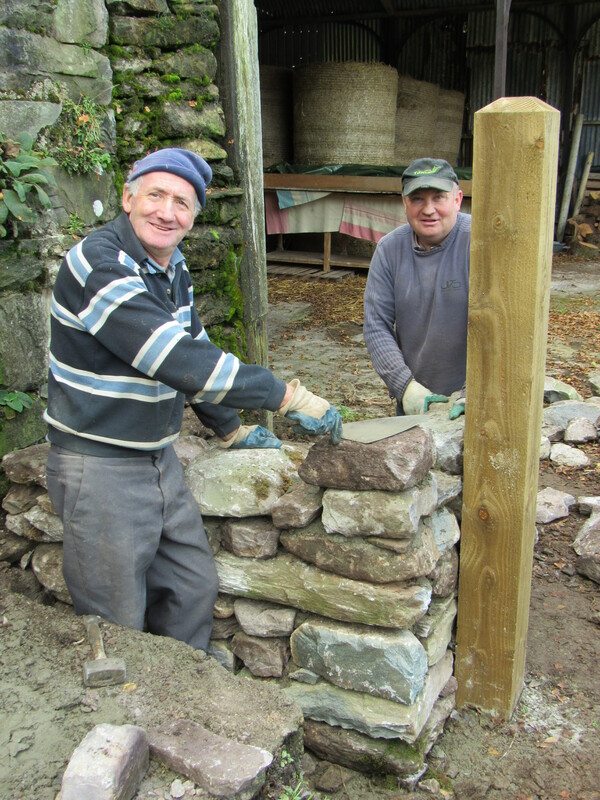 Outdoors, two amazing stone workers (who are also sheep farmers) are busy mending some of the grand old stone walls that frame in the farm’s lush green fields. They’re building some new ones, too. 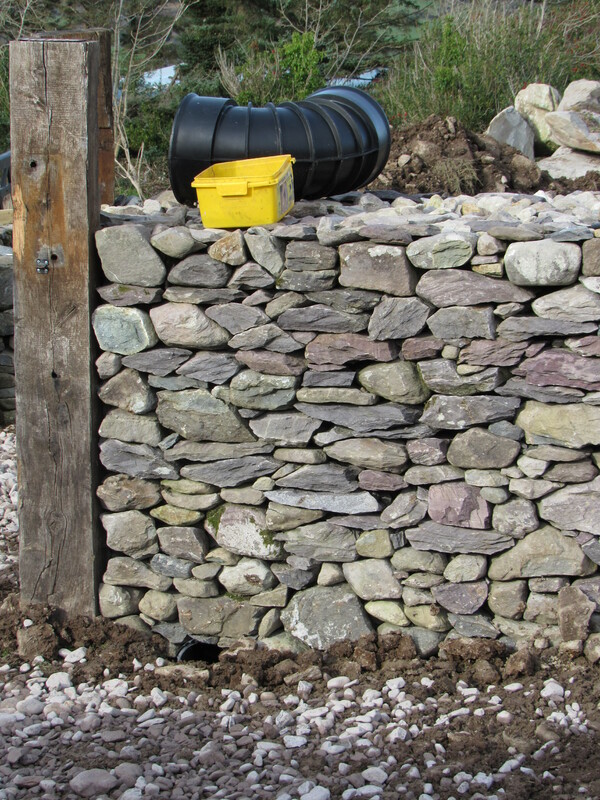 I am in awe of their work, their keen eye for each stone placed or rock split perfectly and then positioned. True craftsman, really. I do love seeing the house being transformed into a much warmer and well lit dwelling. 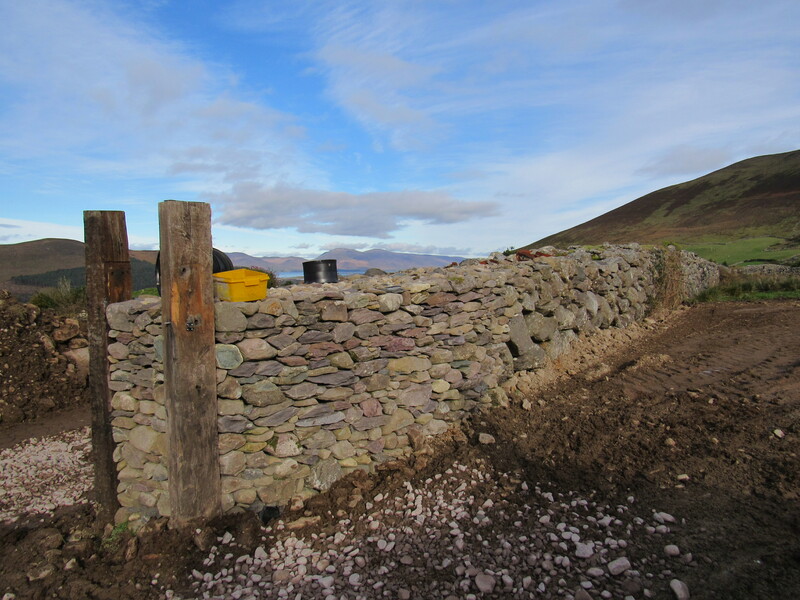 The crew working on that part of the project are genius as well, but it is the keeping and tending of those old stonewalls that has my attention. Knowing that each stone was handled before by some diligent farmer with an intention to contain his livestock and to create separate grazing fields reminds us of the work that was done before mechanization. Now history is coming full circle and being preserved by two thoughtful men who are honoring their roots and rural traditions. 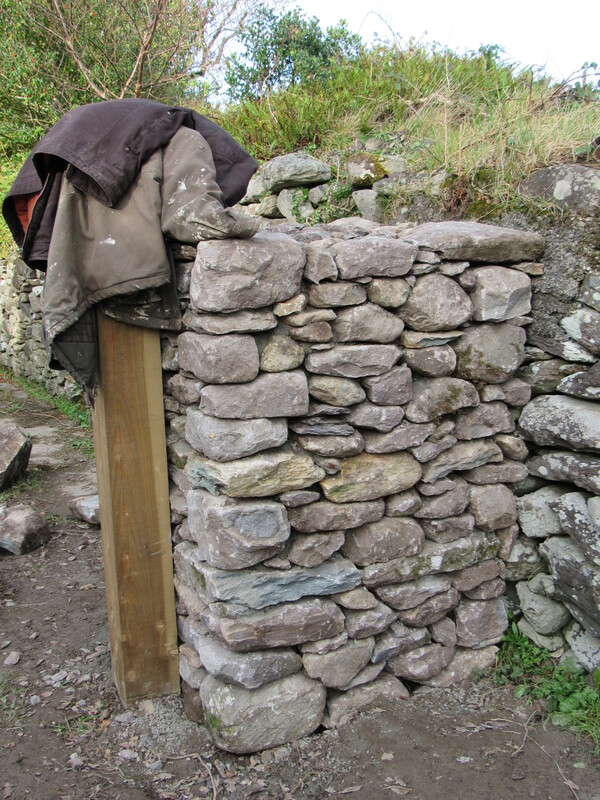 Slowly, carefully, and with great craft they are re-building the stone walls. Beauty, behold. 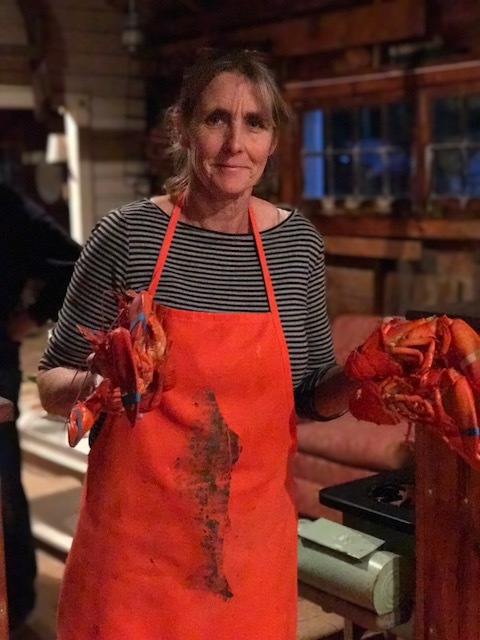 Because I come from a long line of farming, my own roots dating back to the earliest settlers of New England and where stonewalls are a part of our own cultural landscape , I truly appreciate this commitment to land and farming and community. 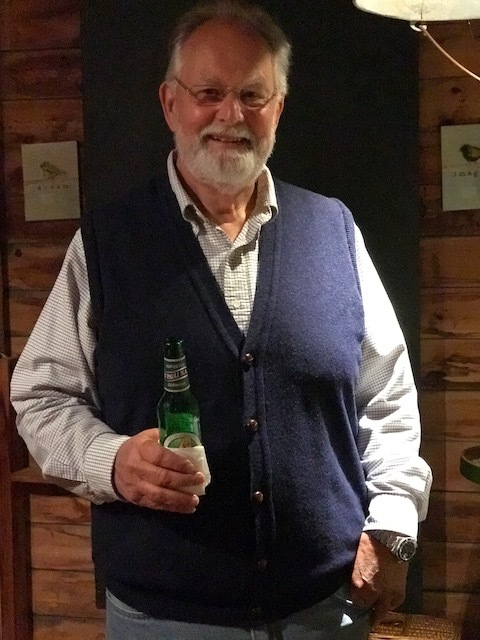 As I have said many, many times before…..traveling away from my life in Maine is never easy, but coming to Ireland is always a profound blessing.